What’s Keeping You From Decluttering? Which of these are your main obstacles? What can you do about your obstacle? Do You Have Piles of Magazine Clippings? We were talking about information/articles torn out/things printed off the internet in the Declutter Group Monday. It’s helpful to think about where you go for information when you are ready for it. If you were to plan a party, would you go to your party planning binder or file folder, would you do an internet search or would you go to the library for a book? If you are creating a garden, or going on a health plan or planning a vacation where do you go for information? That is the kind of information you keep. That is where you store your information. I rarely go to any torn out magazine article anymore. I would search the web or my Evernote online notebook. So I keep almost no magazine articles or things printed. If you automatically go to your binders, then why are you keeping a bunch of folders on your computer? If you get most of your info from books – make sure those are organized and don’t worry about keeping the paper information glut. Information is only helpful if you can find it when you need it. Some experts say making your bed every day brings more discipline and you are more likely to exercise. Some say it’s better to air out your sheets. Some experts say a messy desk impedes work. Others say a clean desk impedes creativity. If you exercise in the morning, they say you are more likely to make it a habit. Afternoon exercise can give you a lift from the afternoon slump. Evening exercise releases the day’s stress. Experts can tell you how to be more productive, have the best body and clean your house. But, none of them are you. What works for you is what works for you. My friend and accountability partner, Marcia, loves the Konmari method of decluttering. That way does not remotely work for me and I teach what worked for me in my declutter class. Personally sometimes I make my bed and sometimes it’s more like a nest surrounded by books for break time. My desk is rarely completely cleaned but I clear it off every few days. (Currently though, as it’s the week before show time for the musical I am in and the desk is pretty messy.) But, no matter how busy I am I always put my makeup and grooming supplies away in the bathroom when I’m done. It makes me cringe to see them cluttering the sink. The good news is there is most likely some expert that says the way you like to do things is the “right” way. So now you can concentrate on figuring out what works for you. This means experimenting not trying to fit into a mold. Exercise at different points in the day and see which feels best. What breakfast gives you the most energy? Does taking a break every 15 minutes, 25 minutes or 90 minutes keep you on track best? What part of home care needs to take priority because it matters a lot to you or your family? There can also be multiple ways to live your life as well. I rarely do the exact same morning routine, but the elements are there most days of the week. Some days I like to start with exercise. Some days I like to ease into exercise after some quiet time. One day may have more meditation, one more journaling, one more music. I check in to see what I need most that day. When situations changed – different marital or children status, new work hours, a health concern, care-giving, etc. 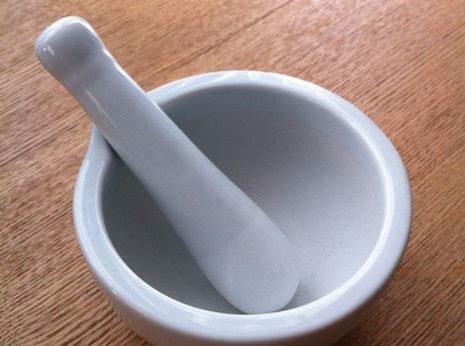 then you can experiment again to find what is most helpful in this new situation. What will you experiment with today? For many people the craft/hobby room or area is the most difficult to declutter. The #1 thing that holds people back is thinking they are going to finish all the projects in there. If you declutter a project maybe that means you failed, never finish anything or wasted money. It could also mean you learned what you needed to from that project, your optional project is no longer fun, or it’s from a different lifetime for you. Be clear on which projects you actually want to do. It’s also important to know how many more projects you can do. 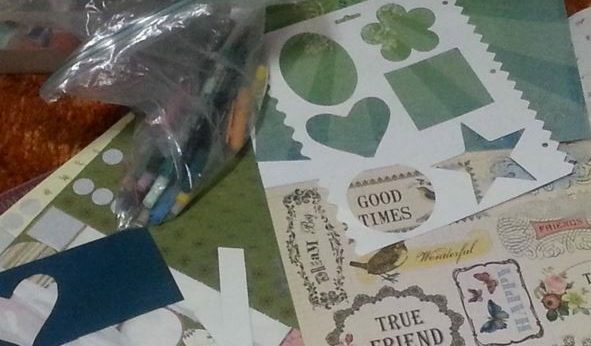 Will you have time to use all those scrapbooking supplies, bushels of yarn or boxes of fabric? If not, a local school or art center would love your hand-me-downs. I know of a church sewing group that makes things for people that need them. When inspiration hits, don’t you want a clear space to work? Or do you want to be going through boxes and boxes of stuff? Keeping everything in hopes of an item igniting inspiration often backfires when there is too much stuff. The mind freezes and the creative mojo runs away. I prefer to buy things for a particular project. I don’t go to Michael’s picking up a bit of this and a bit of that in hopes I will use it someday. Quarterly decide on your next creative projects. If you are done with (either finished or decided you will not complete) any creative project, declutter the supplies. When the new year comes one of the resolutions people make is to declutter the house. My declutter calendar is snapped up. This is why I hold my declutter group in January. But, I don’t want you to declutter to make yourself look better compared to other people’s homes. I don’t want you to declutter to live up to other people’s expectations. I don’t want you to declutter out of a feeling of “not-enoughness.” I don’t want you to declutter to be accepted. You are enough just as you are. You don’t need to be organized or perfect to be of value. So, I want you to declutter so you can enjoy your home, have a nurturing space, make your daily routine smoother or to help you accomplish your other goals. You don’t need to declutter. It’s not a must-do. You only need to declutter if it feels right to you. Not for any outward reasons. I’d love to help you with that. You are invited to join January’s Declutter Group. My son used to make up elaborate schemes to get out of work. He got out of homework when he was about 9 by telling the teacher how overworked he was at home. He told him we make him set up computers and do about 3 hours of chores a night. The teacher felt so sorry for him he let him get away with not turning in homework. Until the parent-teacher conference and we told him it was more like 30 minutes of chores not 3 hours. Let’s say he was doing a lot more chores than usual during the Christmas break. Getting out of work is like that. More often than not, we end up doing more work. Your taxes need to get done and trying to get out of them only leads to more work through an audit. Deciding to do dishes some other time because you don’t feel like doing the work after dinner only makes the dishes harder. You wishfully think if you shuffle around that project, it will get done on its own. We have it in our head that work is bad. It’s not fun, it’s tiring, it’s *grumble, grumble, grumble*. We dig our heels in about how unfair it is that we have to do it. The world is punishing us by making us do it. Your work is to give people what they need. Work allows you to be useful and provide value to someone else. We need to look at work differently to release the procrastination habit. We need to believe that work is as good a way to spend our time as relaxing. When you look on your life, what makes you feel good? For many of us, it’s when we overcame a challenge or made a difference. When we helped someone. How do you feel after procrastinating or trying to get out of work? Guilty? Low energy? You can use that brain power you are using to get out of work, to make the work more fulfilling or more fun. Think about the bigger picture of the the organized home that you can invite people to before you clean. Notice how you are helping yourself and others. Work is a privilege and a service to others. Work is how we achieve our goals whether it’s a decluttered house or running a 5K. Most of us want the results – the clean house, the good income, the excellent blood pressure. Yet, we run away from the work thinking it will be too hard. Will it? Are you up for the challenge of changing how you see work? I’ve been reading the life-changing magic of tidying up by Marie Kondo. 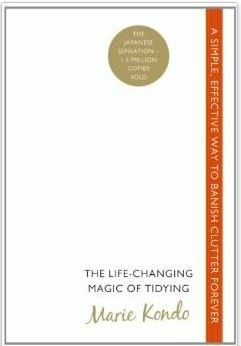 Since the Declutter Group starts today, I thought I’d read to get some fresh inspiration. But her way of decluttering is definitely not my way of decluttering. She suggests decluttering in one swoop, get everything organized to perfection and then you will automatically keep it tidy forever. She says it has worked with her clients. 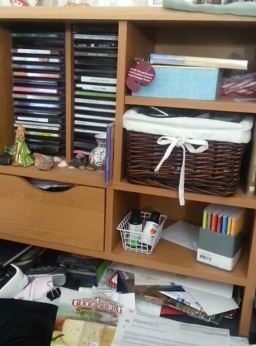 I’ve been running declutter groups for about 7 years now and none of my clients have enough time to declutter all at once. Decluttering 5 minutes a day can be considered progress. Since life is not stagnant I don’t think you can organize and declutter everything at once and be done with it. There are life transitions – marriage, a baby, a loved one’s death, a new job, a new hobby, letting go of projects and ideas of yourself. Caring for your home is an on-going, ever changing thing. Caring for your home requires maintenance. Some weeks there will not be enough time for it and you may have to catch up on the weekend. I’d love for people not to feel badly about that. I want decluttering to feel lighter and more fun. We laugh a lot in the declutter group. All that said I am still looking forward to continuing reading. It’s important to read things that view things a different way and maybe I’ll pick up some great ideas to share with the Declutter Group. I work with many people to help them declutter and most come with feelings of overwhelm even thinking about decluttering. The project seems too big, too hard and too daunting. Plus they have begun over and over again only to quit. They don’t trust themselves to begin again. If you can’t think of where to start, use something like my declutter calendar to kick start your progress. When you get stuck, instead of beating yourself up, allow yourself to be stuck. Put the item aside to decide later or ask someone to help you decide. Put on fun music to make it feel more like a party than a chore. Florence + The Machine has music with great beats. Don’t try to get it all done in a day or a week or you will get burned out & quit. Create a plan so it’s easier to start and stop decluttering. Don’t declutter haphazardly or you won’t see your progress. Release the need to declutter perfectly or see it as all or nothing. Go at your own pace based on the time restraints of your life. Even 5 minutes is going forward. Declutter with a friend. Laughter is sure to happen. Laugh at your patterns of keeping junk and happily release your stuff creating a new pattern. See decluttering as a way to nurture yourself and your family, not another thing to do. 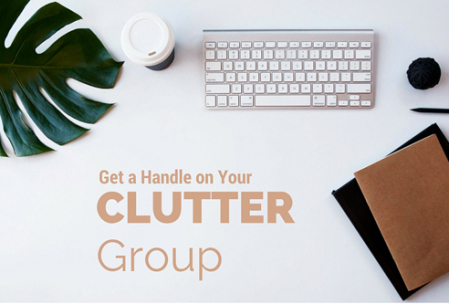 Declutter with a group for more fun and accountability. Get encouragement from others (we know the family usually doesn’t get excited that you’ve decluttered.) I am hosting an online declutter group that starts in January if you are interested. 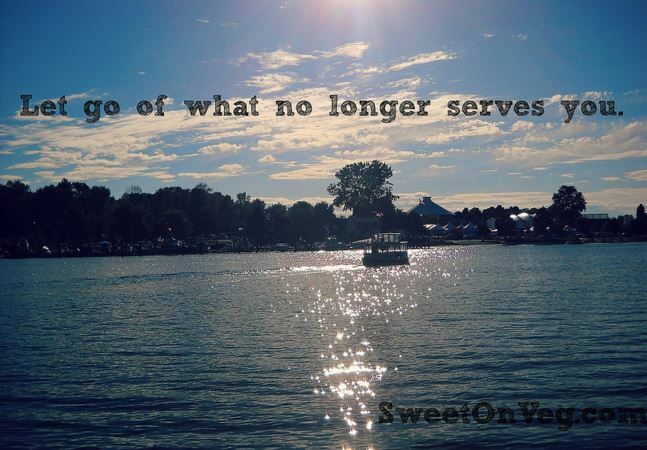 Decluttering feels freeing so allow yourself to feel lighter as you are decluttering.